Despite being highly urbanized, Bur Dubai (a prime area) offers architectural glimpses into Dubai’s past, exemplified by the Dubai Museum in the Al-Fahidi Fort, built in 1800. Said to be Dubai’s oldest building, it used to be the home of former rulers and was converted into a museum in 1971.Another historical residence in Bur Dubai that is now a museum is the Shaikh Saeed Al-Maktoum House, built in 1896 as the home of the present ruler’s grandfather. It serves as a prime example of historical architectural design in the Middle East. Bur Dubai’s other historical attractions are the Sheikh Mohammed Centre for Cultural Understanding, the Heritage and Diving Villages, and a rebuilt Bur Dubai Souk. Due to current efforts to reconnect the Dubai Creek with the sea, Bur Dubai will eventually become an island by 2010. This neighbourhood in the east features traditional courtyard homes with old-style wind towers, built at the turn of the 20th century. Its historical landmarks blend with modern low-rise apartment buildings and tourist accommodations. Small stores filled with discounted goods compete with shopping malls for bargain hunters. Near Dubai Creek is the residential middle-class subdistrict of Karama, which means “dignity”. Built in the 1980s, Karama has older homes than the other areas of Dubai. The cityscape has a uniform grid pattern look, with the height of buildings not going beyond four storeys and all painted in pale colours or in white. Within these two square kilometres of low-rise structures are apartment buildings and small businesses, run mostly by Indian and Sri Lankan residents. Aside from its South Asian residents, other non-UAE nationals include Europeans, Lebanese and Iranians. Most residents here rent their homes. Karama is also a source of shopping bargains, from purses to watches, from clothing to furniture. North of Karama lies Bur Dubai’s diplomatic neighbourhood by the Creek, where many embassies and consulates hold office. Zabeel in northern Bur Dubai is divided into Zabeel 1 and Zabeel 2, both filled with high-end villas and townhouses. 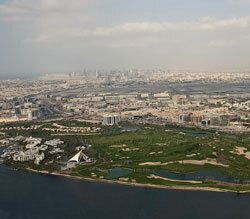 are Zabeel Stadium and Dubai’s own version of Central Park, the 48-hectare Zabeel Park which opened in 2005, and the UAE’s biggest public park. The park is divided into three major zones: the Technology zone, the Communications zone and the Alternative Energy Zone. To the east lies Zabeel 2, where the current ruler, Shaikh Mohammad, holds official duties at Zabeel Palace. The Dubai Racing Club’s Nad Al Sheba racetrack is also in this neighbourhood. Sometimes called the diplomatic area or the Old Pakistani Consulate Area, Al Hamriya houses the consulates of India, the UK, Saudi Arabia and Kuwait. Despite the neighbourhood’s name, the Pakistani Consulate is no longer here. 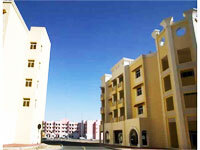 A lot of decent, one-bedroom studio apartments are available in Al Hamriya. The popular Bur Jurman Centre Mall is in this area here, along with other commercial complexes, as well as the Al Muassala Towers, the Abu Dhabu Commercial Bank and the Sheraton Four Points Hotel. Oud Metha is also called Al Nasr, which means “victory”. It is centrally located near major access roads. Aside from pretty and new low-rise apartment buildings, this community teems with schools, shops, entertainment centres and clubs. It hosts the Al-Nasr Sports Club, Dubai’s football club that plays in the UAE League. Also in the area are the Rashid Hospital, the American Hospital, Lamcy Plaza (Dubai’s largest mall), the popular Al Nasr Leisureland and the Sultan Business Centre. Social clubs such as the Pakistani Association of Dubai and the India Club also have their homes in Al Nasr. Among schools catering to international students here are St. Mary’s Catholic High School, the Indian High School and Our Own English High School. Under the master plan, Dubai will become an arts and cultural leader. Culture Village, on the Dubai Creek between Deira and Bur Dubai, will showcase the best of Middle Eastern artistic offerings. The project’s centrepiece will be the Museum of Modern Art, on a man-made island on the Creek. Dubai Maritime City, near the head of Dubai Creek, is a waterfront free zone for maritime businesses. It has two exceptional marinas, Harbour Marina and Maritime Centre Marina, with boat maintenance services and numerous berths for luxury yachts. The marinas have fine dining restaurants, retail stores, and clubhouses. There are attractive promenades along the waterfront, and a stately central boulevard, the Maritime Centre Drive, with flowing architecture inspired by the area's waterside location. The Harbour Residences offer wonderful seaside views from towering residential developments. There are offices and clubhouses here as well. There’s also a massive academic complex, the Dubai Maritime City Campus. A causeway connects Dubai Maritime City to the greater road network of Dubai.